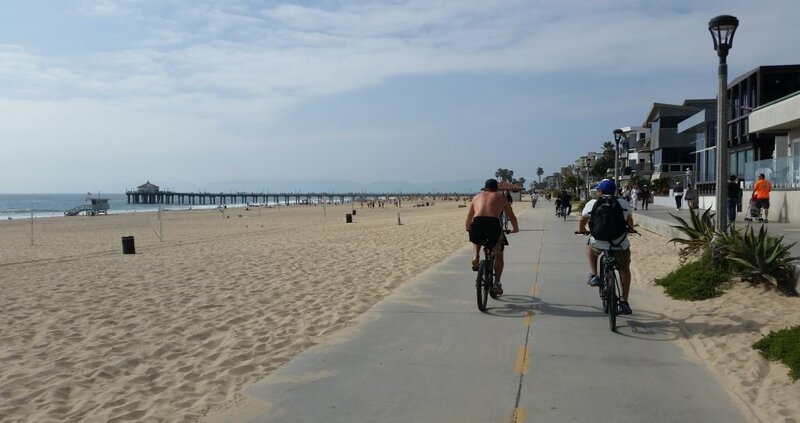 The South Bay Bicycle Trail, also known as The Strand or Marvin Braude Bike Trail, is a 22-mile paved path that runs from Will Rogers State Beach below the cliffside houses of the Pacific Palisades to Torrance County Beach, near Palos Verdes. Most of the trail is on the beach, although a few sections venture briefly onto city streets. Bicyclists, joggers, skaters, wheelchair riders, and pedestrians all share the trail so it can get quite busy, especially on weekends and holidays. The smooth asphalt and concrete surface is about 14 feet wide for the majority of the trail. 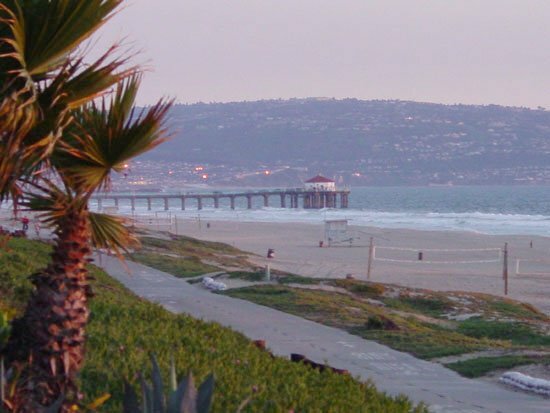 Beginning at Will Rogers State Beach you pass Temescal Canyon County Park and soon arrive at the Santa Monica Pier, a great place for your first break to ride the Ferris wheel, roller coaster, or carousel and grab a bite to eat. 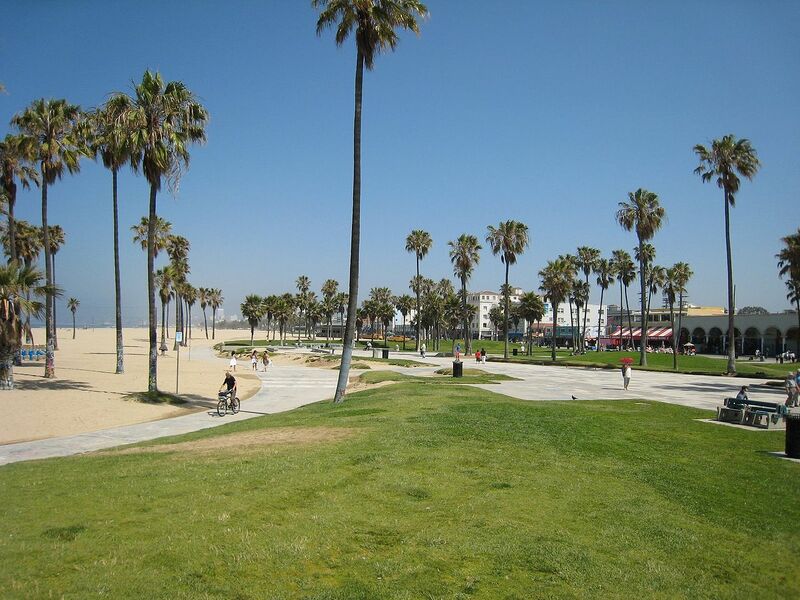 Once past the many attractions of Santa Monica, the trail leads into Venice Beach, home of the original Muscle Beach. Here you’ll also find skate parks, artists, street performers, and many quirky shops. 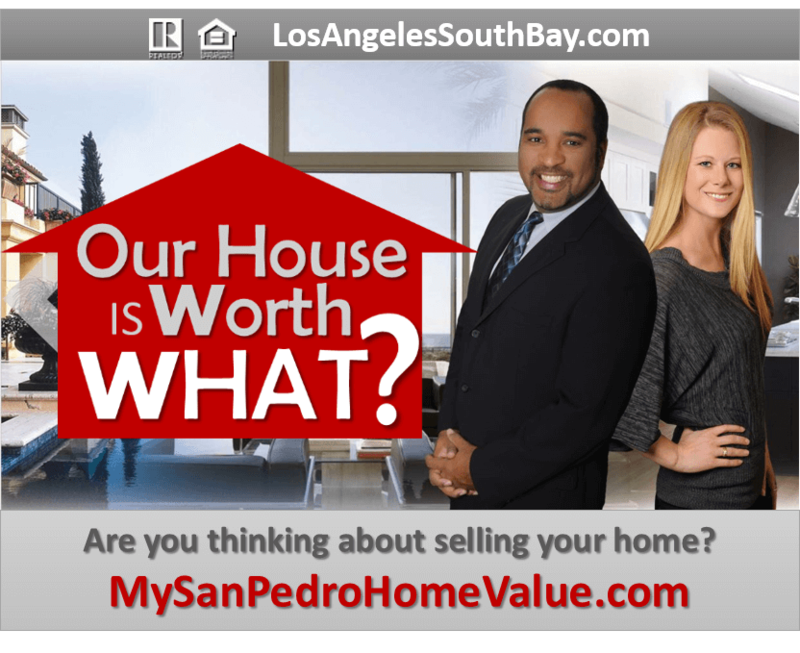 The trail continues and dead ends at Ballona Creek, so to reach Torrance you will need to take the bike lanes on Washington Blvd (across from Venice Pier) inland about 0.8 miles to pick up the trail around Marina Del Rey. The trail is well signed as it passes through parking lots in the marina area. Another on street section is Fiji Way, which leads to the Ballona Creek Bike Path and back to the beach in Playa Del Rey. South from Playa del Rey the trail passes through Dockweiler State Beach and under the planes taking off from LAX before entering Manhattan Beach. Manhattan Beach is the birthplace of beach volleyball, so there will definitely be some bumping and spiking to watch as you ride past. Take a break here and explore the Manhattan Beach Pier with its unique aquarium at the end, before traveling on to Hermosa Beach. 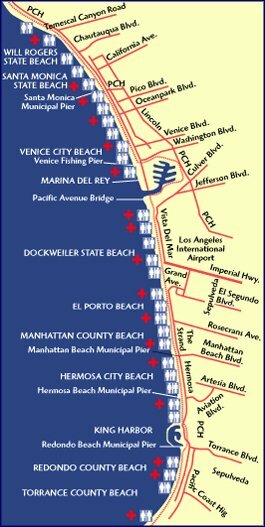 After passing Hermosa Beach, another on street section is required around the marina in Redondo Beach, so use Harbor Way for this stretch. 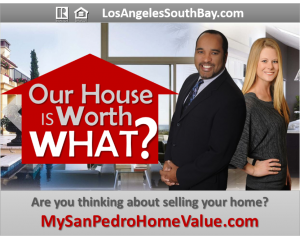 More shopping and dining opportunities await at the Redondo Beach Pier. From there, the trail ends at Torrance Beach where the cliffs to Palos Verdes begin. Don’t have your own equipment? No problem, several rental stands are located along the trail which offer bicycles, roller-skates, and roller-blades for rent. Some facilities also offer three-wheel recumbent bikes. 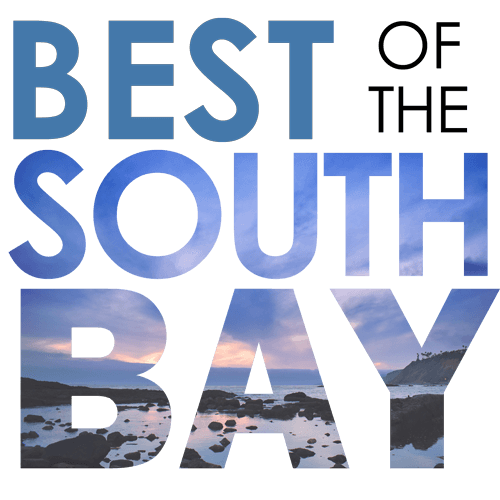 While we strive to present information as accurately as possible, Best of the South Bay is not responsible for the accuracy of this information.